Can Colloidal Silver Help Reduce Acne? Acne is usually the result of hormonal shifts in the body during puberty and obviously appearance conscious teens seek to eliminate it. Using Colloidal Silver to reduce acne seems like a logical idea to try as it is anti-bacterial, and acne seems to be related to unwanted bacteria in the skin pores. But to treat acne solely with Colloidal Silver is an attempt to treat the symptoms rather than the source of the problem. Any reduction is acne from applying Colloidal Silver topically will vanish if the user stops applying it as the true source of the acne hasn't been addressed. Many websites discouraging the use of Colloidal Silver for acne make inaccurate claims about the "dangers" of using it, primarily being the accumulation of silver in the skin, causing a greying or bluing. Please see our page clarifying the issue of side effects. Since our product is pure ionic, it does NOT accumulate in the body. There are no side effects, only potential benefits, depending on your state of health. If you're already at the peak of health, Colloidal Silver will simply be a backup system to your already strong immune system. The worst products to use are silver salts, where the silver has combined with another element and can't be passed out of the body and that react to light. An example we are all familiar with is in photography. The silver salts in photographic film are sensitive to light. So Should I Try Colloidal Silver To Reduce Acne? Deciding to try Colloidal Silver to reduce acne is a good choice for one important reason! Whether its helps to reduce acne or not, you will be able to use it for many many other purposes from daily supplementation as an immune system builder, for keeping wounds and burns sanitized, for oral hygiene, for healthy ears and eyes, and much much more. Please see our page about uses for colloidal silver for more. In other words, your hard-earned money won't be wasted because colloidal silver wasn't invented as say an acne cream that has no other purpose! It's a home remedy that helps with dozens of things in a natural, inexpensive and safe way! How Would I Use It For Acne? Using Colloidal Silver for reducing acne is easy! Simply take the time to thoroughly wash the skin and let it dry. Then using a fine misting spray bottle full of colloidal silver, lightly spray your face. Do not worry about spraying the eyes or mouth. The silver ions will go to work on whatever bad bacteria and viruses that may be present. In fact, many people periodically spray their whole body! And breathe deep while spraying. Colloidal Silver is excellent for the lungs. Many people use a nebulizer to ingest their daily dose rather than swallowing! 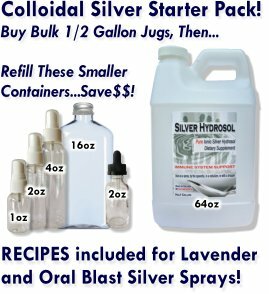 Please see our page on ways to ingest colloidal silver! Then let it have a chance to absorb in your skin. Keep misting your skin for a few minutes. The silver ions are so small, a fraction of a nanometer, that they can immediately penetrate cellular membranes. We don't claim that Colloidal Silver will reduce acne, but we have been told by our customers that it has helped. Try it for yourself, knowing that your purchase will benefit you in many others ways if acne reduction proves not to be one of them. Are There Ways To Go After The Source Of Acne? Yes!! Nature is jammed packed full of sources of healing and nutrition! An excellent place to start is with diet. Eliminate all processed foods and add supplements that are really just dried organic fruits and veggies in powder form. Maca root powder is a powerful hormone balancer! Beta Carotene is another potent source of help. The bottom line is actually the bottom line. We will spend money on solutions one way or another. Unfortunately, we don't know exactly what will work or not work to reduce acne until we try it. That include chemical-laden products from a laboratory as well as natural remedies from Mother Nature! Obviously, at Nature's Gifts, we are proponents of natural solutions because almost exclusively, they don't have the potential to do harm while "fixing" something. That can't be said for anything that comes from a laboratory. Just read the warning labels of these products that rely on chemicals, not nature. Got Any Stories Of Colloidal Silver Reducing Acne? Tell Us!! We would love to hear your experiences with Colloidal Silver and acne, the good, the bad and the ugly! What have you tried, how did it work, what was your technique, how long did it last? Each person is unique so we don't doubt that experiences vary.